its analog pressing?. Anyone know? . . . . . . It was easily a truly defining and pivotal moment in my life, and no doubt there are many others who carry such a burden which they feel holds them down. But I just couldn't keep it to myself any more, I was tired of living in shame and hiding away from who I really was. My parents would still love me, right? My friends would help me through such a transitional period, right? It's the 21st century, society would still accept me, right? Because it was time for me to come out. I'm a James Blunt fan. Poor Jimmy Blunt is quite often the recipient of unfair criticism, I mean, sure, he writes soppy love ballads, is unbearably cheesy, and has a nasally, almost-whiny high-pitched voice, but underneath all of that, there's some solid songwriting going on, with catchy tunes and some rather nice melodies. Plus, he's a Wiltshire lad like me. Good on ya, mate! With lots of rich, multi-layered songs, featuring a vast array of instruments and sounds, and plenty of vocal harmonies that are easy on the ears, 'Back to Bedlam' is a melancholic yet relaxing affair, with personal lyrics that sound like they most probably relate to a lot of Blunts experiences in the military, but could just as easily be the usual balderdash that focuses on love and relationships, or isolation and anxiety. Who truly knows but James Blunt himself? I don't. That's for sure. Still, there's some nice gems to be found in songs like 'High', 'Out of My Mind', 'So Long Jimmy', 'Billy' and 'No Bravery'. And hit single 'Wiseman' is an absolute banger of a track that fully justifies Blunts success. 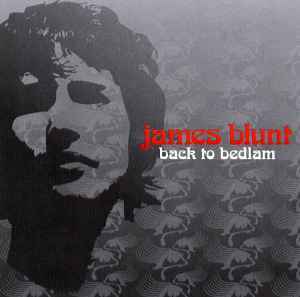 Overall, 'Back to Bedlam' won't make any top album lists in my book, but it's a short, 40-minute slab of cheesy ballads that certainly don't do any harm either, and if you can get past the public perception of Blunt himself, then you'll find that he's a competent songwriter who's more-than capable of putting something of substance together. If they reissue it with care I'm all for it. The original vinyl is demo disc worthy, tall order to a reissue would have big shoes to fill. Why no repress on vinyl??? This would surely sell by the bucketload!! Repress on vinyl please! One of the best albums ever! Wisemen............what a track!